While studying urban planning in graduate school I became fascinated with the sociology of public space. Why were some paces used more than others and why were some spaces perceived to be inclusive or exclusive by certain populations. During an internship in the New York City Department of Transportations innovative Office of Public Spaces, I began to understand that our streets were actually our largest public spaces and through public plazas for example, they had the ability to be transformed in to spaces that prioritized pedestrians instead of cars. For my master’s thesis, I merged my interest in public space analysis, transportation planning and women’s studies by looking at what deters women to ride bicycles in New York City. Not unsurprisingly, motorist aggression and fear of personal safety were the greatest deterring factors for women but what surprised me were the limited opportunities encouraging those unfamiliar with riding a bicycle and the lack of attention to the needs of a wide variety of users in the design of our cycling infrastructure and facilities. In spite of the ground that women have gained in the fight for equal rights, studies have show that women are more likely to run household errands and transport children and elderly family members. For some women, this can make their travel behavior and willingness to take risks different from that of a single rider traveling from Point A to Point B. 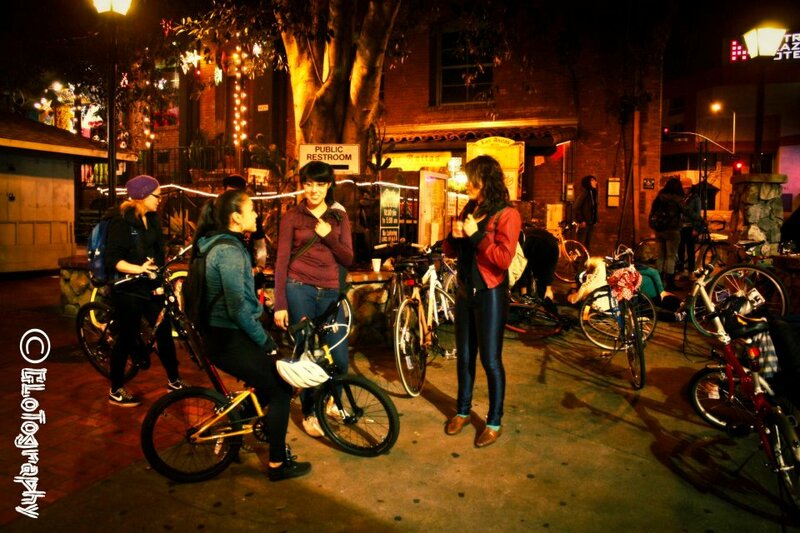 Often, I look for examples of thoughtful cycling infrastructure and the encouragement of bicycling to a wide variety of users (specifically women) so today I was ecstatic to read about the Ovarian-Pyscos, an East Los Angeles bicycle collective, in Los Angeles Streetsblog. 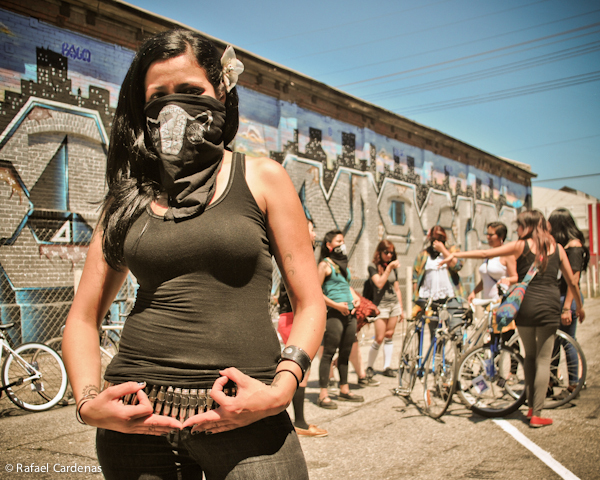 The Ovarian-Psycos Bicycle Brigade, an all-women bicycle collective from East Los Angeles, is not only supporting one another in cycling through the city and raising awareness about cyclists, they have become a powerful collective supporting women’s rights, social justice and each other. “Two months ago, when 22-year-old Bree’Anna Guzman was murdered in Lincoln Heights, the all-women bike group Ovarian-Pscyos Bicycle Brigade scrapped their previously planned ride to ride instead through the neighborhood to protest the killing. ‘Whose Streets,’ one woman called out. “Many of the women say they feel they are not taken seriously in the biking community because their rides aren’t as long as traditional rides, there are usually many first-time riders, and the ride will stop and wait for one person. But, these limitations, Ova member Natalie Fraire said, can be a positive. The Ova’s excel at inclusion. If you have any interest in learning how to ride, they will be there to support without judgement. This collective is strong, supportive, and has changed the lives of the women involved. Most importantly, it has given the Ova’s a sense of empowerment which all women richly deserve, cycling on the streets and beyond.